Complete Fuel Injection for Jeeps. This Master conversion from carburetor to fully programmable fuel injection is designed as a total package update of the factory induction system. 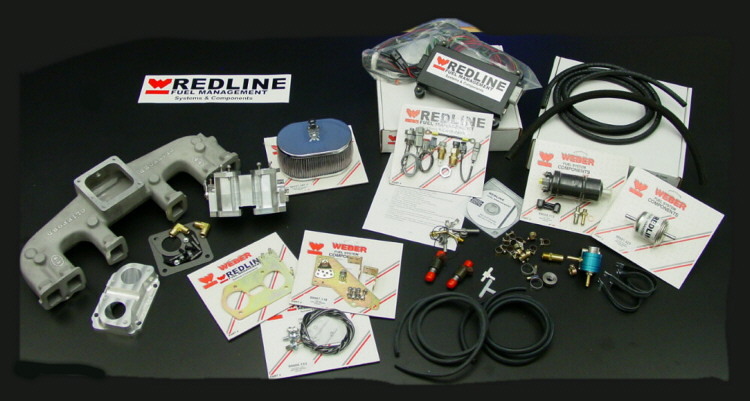 This system is complete with improved Clifford intake manifold and high volume high flow Redline throttle body. Using the latest in computer technology for fuel system and ignition control. Total engine management upgrade, improving the ignition as well as fuel controls. Developed for the new age of Offroading. The need to be able to travel over any terrain and still be street usable, and provide the performance to travel at reasonable highway speeds. Only with fully programmable injection can you get the full value of performance improvements and total control over fuel at any angle or rough terrain. Currently the only options of this kind have been non-programmable factory injection systems that leave you limited and wanting. Redline has the total solution. Developed in conjunction with Clifford Inline the leader in 6=8, 50 years of inline 6 experience combined with Redline fuel management technology for the ultimate in bolt on Jeep performance. More torque, with smooth all terrain drivability and ultimately increase Horsepower. Legitimate highway speeds with out the effort. Fuel system upgraded and includes pump, regulator, filters and fuel lines.